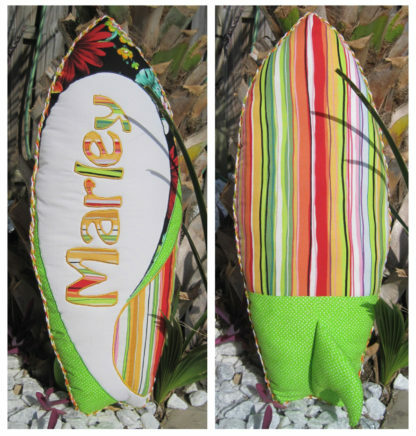 Beach boys and surfer girls alike will love this Surf Life Safari pillow design! Make one today for your beach house decor, whether you’re coastal or inland. Get that beachside feeling wherever you live. 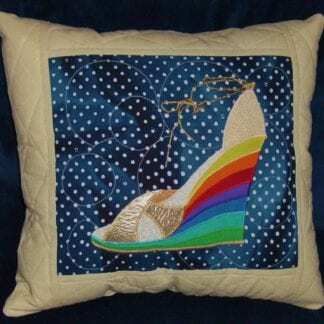 Full size sewing and applique patterns, so you don’t have to resize them. 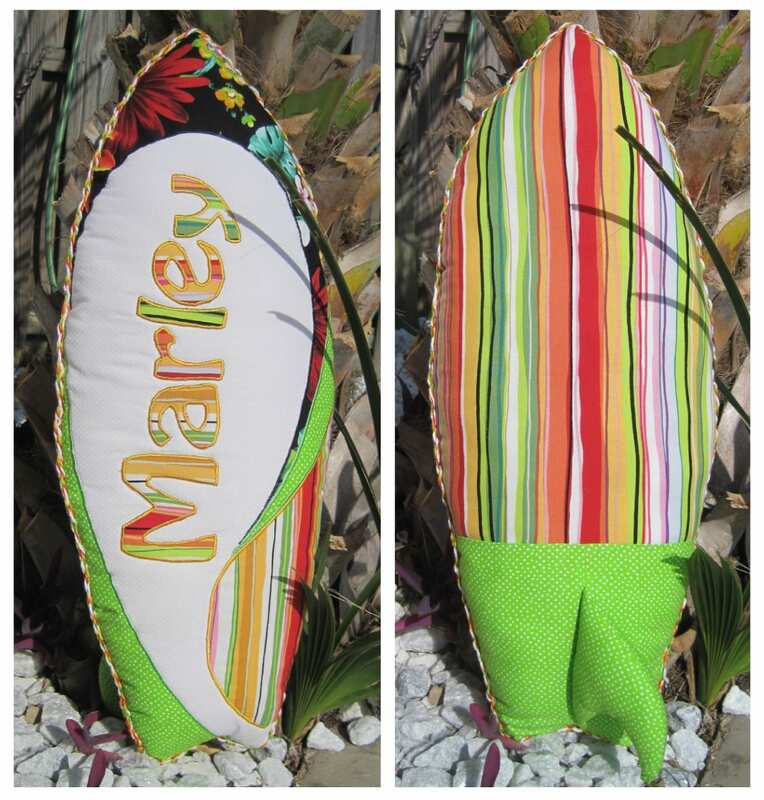 Beach boys and surfer girls alike will love this Surf Life pillow design! Make one today for your beach house decor, whether you’re coastal or inland. Get that beachside feeling wherever you live. I designed Surf Life as a gift for baby Ryan, destined for his tropical themed nursery. My idea was to create a three dimensional accent pillow, shaped like a surfboard. 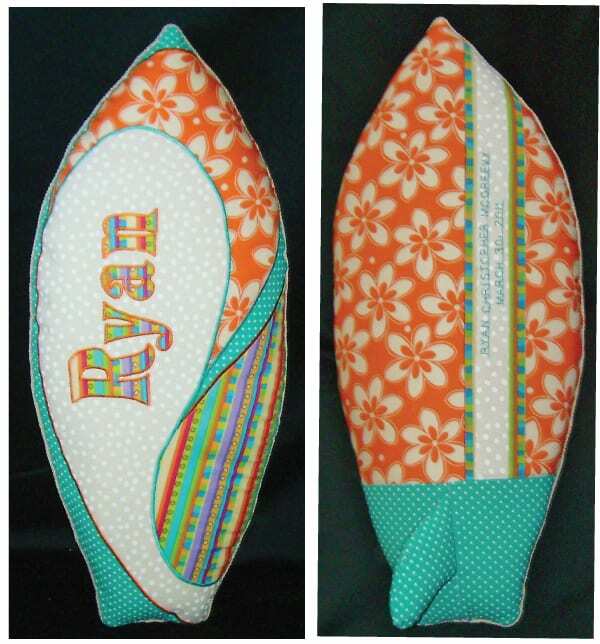 I used several coordinating fabrics in a tropical theme, and appliqued “Ryan” on the pillow top. 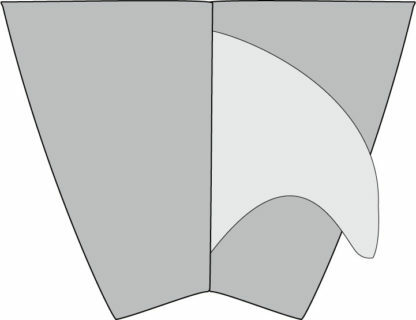 A fin or “skeg” on the back completes the design in true surfboard style. 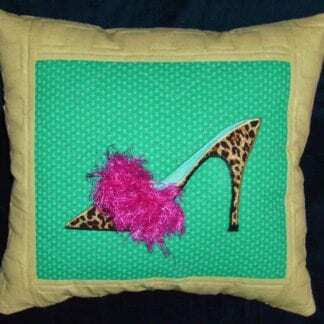 As a finishing touch, I embroidered his full name and birth date on the bottom of the pillow. 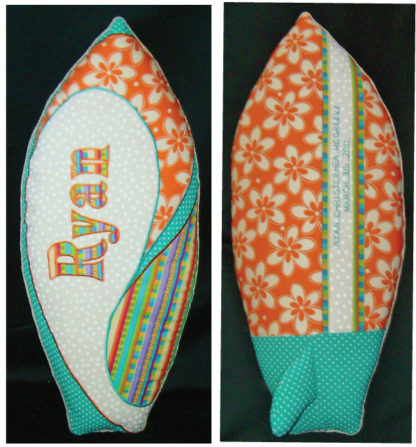 Picture a Surf Life pillow in your beachy nursery, child’s room or family room. Place a few on your sofa, chair or bed. Add your child’s first name or family last name for truly personalized accent decor. Take the surfboard top design and use it on a Surf Life quilt or wall hanging. 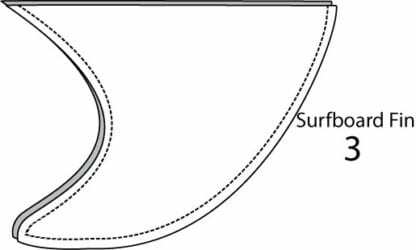 Create a variety of “surfboards” in different prints and colors. Put names on some of the surfboards, applique flowers on others. Applique the surfboards on blocks, or make a whole cloth quilt. Makes a truly tropical quilt for beach lovers of all ages!